I made this tasty recipe for my sister last week. She is a huge seafood fan, so I am trying to cook a lot of the food that she likes while she is visiting. 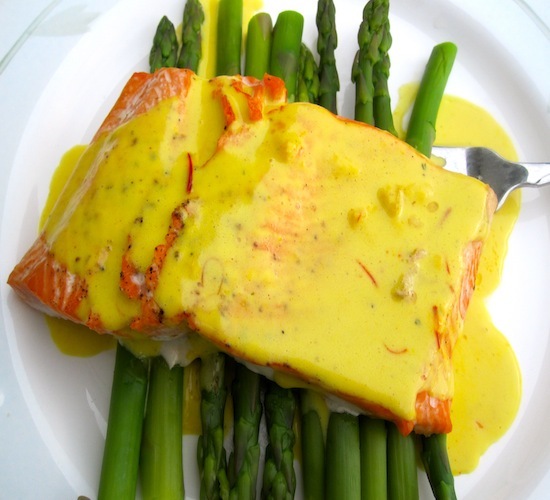 We both love salmon very much and I wanted to make something different and special for her and that is how this Salmon with Coconut-Saffron Sauce was born! It was fantastic guys…the coconut and saffron together is a marriage made in heaven and the saffron gives this dish a beautiful color too. Place the salmon fillets in a large baking dish. Drizzle olive oil and season each fillet with cumin, salt and pepper. While the fish is cooking make the sauce:In a medium saucepan melt the butter. Add the onions and cook for 3 minutes, stirring often. Add the garlic and cook for 1 more minute. Add the coconut milk, heavy cream, saffron and chicken bouillon.Bring to a boil, then reduce the heat to low and let it simmer for about 10 minutes stirring occasionally. Spoon sauce over the salmon fillets and serve warm. That looks wonderful Erica…..just delicious!!! Ooooh, this looks interesting! We tend to only use our saffron for making paella, which is just ridiculous. This looks like a must-try. Beautiful. What a great idea. I bet that sauce would be good with shrimp as well. Thanks for a new twist on salmon. The sauce sounds amazing – I love how you have it all on a bed of asparagus. This would be perfect for dinner outdoors on a warm spring evening! This dish sounds so good. 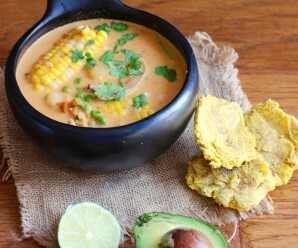 I love coconut sauces. Wow, coconut saffron sauce sounds amazing, what a great idea! This looks amazingly delicious….the colors are spectacular! Looks great. Love salmon and sauces! This looks like treasure on a plate! This is exactly the kind of stuff I love eating at home. You making me very hungry! Wow!! that sauce looks incredible! Cant believe its so easy to make. Very clever indeed! love the way you served asparagus with it too!! Love salmon and love finding new ways to serve it. The combination of saffron and coconut in the sauce sounds delicious. Very interesting sauce. I love coconut and saffron and I bet they paired very well. 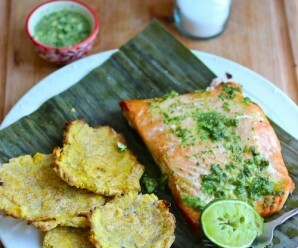 We love salmon and this dish looks so gorgeous! The colors are amazing, I would just want to sit and look at it! lol! I am definitely going to bookmark this one and make it soon! Thanks! what a dashing sauce! i love the coconut component. yep, this is yet another winner! last week I planned to make salmon with cream and saffron. Here you are with even a better version. Wow I just got some saffron from my sister’s trip to Spain, now I use for something else other than a paella! thanks. Wow the colors just pop – the salmon color of the well, salmon, the bright yellow of the saffron and the lovely green of that gorgeous asparagus. They say to try to eat from all the colors and this dish covers several in one go. What a yummy looking meal. sound delicious!!! a must try!!! Ooooh,….aaaaaah,….oooh,…I am truly gobsmacked by this fantastic looking dish!! Just look at those radiant colours! Aaaaah,…I am in heaven now! Erica – This is an absolutely stunning meal. I bet your sister loved it. You know the word that would apply to this Erica? “scrumptious”! What marvelous colors in your dish, Erica! I love that sauce. I’ve never sprinkled cumin on my salmon either. Going to try it! You have cooked my favourite…salmon! Love the sauce. It has to be delicious. Gorgeous! Such a great pairing of ingredients and flavors and so bright and pretty too. This looks great- that sauce looks especially wonderful! This looks so amazing, I am putting on my list to try. Can Coconut-Saffron Sauce be used on any fish. Also what is saffron here in Colombia…………? Fr@- saffron is azafran Espanol. You can use the sauce on any fish or shrimp! where can i get the saffron? I made your recipe this weekend and it was a huge success. I tweaked it a little and thought you might like to hear about it. I didn’t season the salmon with cumin, but just plain salt, pepper and olive oil. Instead of onions I used scallions and also added some peeled, chopped (big pieces) tomato. I also sprinkled some Italian parsley before serving. Pilar- It sounds delicious!!!!! I am going to try your version! Erica i made this dish last night and my husband and i love it!!!! The sauce was so good!!!! Thank you!!! This is a good recipe for beginners like me. Tasty, easy and the whole family liked it. For sure I will do it again soon. Thank you for sharing your recipes, your site is one of my references for cooking. So yummy!! I added some sugar just to add a little sweetness to the sauce! It was a hit! I never leave reviews but felt the need to do so because this recipe is beyond a home run. I typically modify recipes but it’s sheer perfection followed exactly as is. Simply stunning and that sauce is magical. buscando una receta en este sitio nunca me defraudan! Qué delicia, esta noche lo haré. I made it and i cooked shrips with the sauce then I poured it over the salmon.. it was amazing !! !